not much but its coming along. The way I ended up doing this is making the fodder evolve, because the only way you can control an evolution is digits one to six I made the player only die to show that they died. you really have unlimited lives. just play around a bit and youll see the overall idea. if you find a interesting ship just write down the values on the far left hand side of the demo and post them up here so I can take a peek. if your interested in how I did anything just ask. I really like the idea of a boss battle after each evolution-- it's as if you have to pass a test before you can continue on with your new upgrades! Great thinking. thx! but unfortunately I probably wont have enough time or know how for a evolving single boss the way I would want to do it. So, not to worry though evolution is still in my game in a different place though. The cannon fodder evolves. its pretty simple since its a open dev session I wont really make it a game, just a way of boosting ones evolutionary attributes thus making a potentially more deadly fodder. Ill post a GM6 with my entry which I might not get done on time. my apologies, I am in gr 12, kinda stacked. Just happy to see you participating. Post what you get finished, no matter what you think of it. A few of us have promised to do that, despite not getting as much as we'd like done. Best way to learn and I still hope to see some new ideas if not implementations of them! Well I'm happy to see an entry like this, late or not. It's certainly the most complex take on the evolution theme. I must say it is a bit confusing though. Perhaps you could explain a little more to us? At first I guess I had it on 6, and all I got was demonic enemies with impossibly fast bullet patterns. So setting the "evolution cap" with the digit keys is basically like setting the general difficulty level of the enemy evolution? Quite difficult, but possible and quite exciting bullet patterns I think. I also think maybe it would have been cool if you included controls to let the player play with the values more directly, but you did include the GM6 file, so i'll probably try playing with that. Any chance you might reveal to us just what the different values control? Anyways, a very interesting entry, and thanks for posting it! Edit: Oh, I seem to have neglected to include the other two numbers above (I just wrote down the ones along the left side). Hope that's not too important. 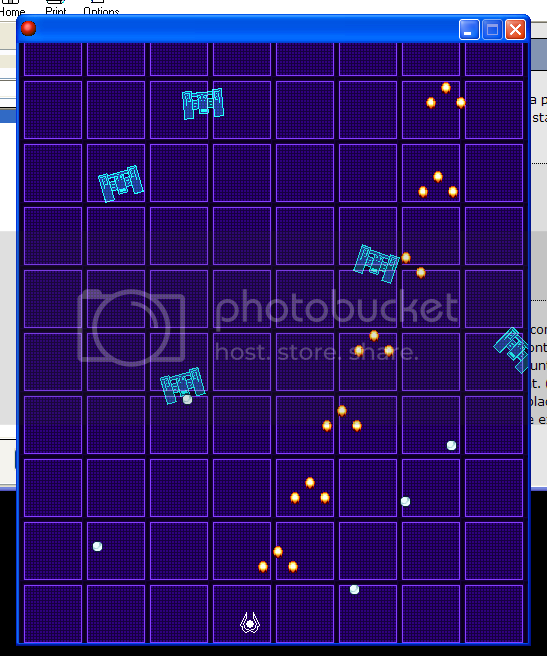 This one feels a little more bullet hell, more chaotic, but again very possible. I actually found this one quite manageable even on my keyboard (which usually leaves me incompetent at shmups), despite the number of bullets. I think this is also due in part to the solid control and excellent visibility you've worked in. you are quite right in the sense that the evolution cap is the relative difficulty of the ships that are built. The reason why they are impossibly fast demonic ships is because I never really had time to balance it out fully. but the degrees of difficulty are clear when you change cap levels. I use the values and some scripted switch statements to determine values based off the random numbers which are then added up and made sure to be with a 2 digit range of the cap. the right hand numbers are not important, for playing a certain ship you just have to comment out the do until operator in the init script, it surrounds all the variables and makes sure its the sum of them is within bounds. Im not too good at programming user imputs in gm other than the simple pop up boxes but if you guys want a EXE version that allows you to manually change the vars ill post one. thx moosa those are really cool builds I really like the second one alot. I'm content to just fiddle with the GM6 file myself. Another thing I forgot to mention: I'm not sure if you're aware or not but apparently games made in GM6 wont run on Vista unless you use a special converter program. I made my entry in GM6 as well, and 2bears had pointed that out to me (apparently he's using Vista). And anyone with Vista and GM7 registered can build their own Vista compatible version too from the .GM6. Also, the game's pretty interesting. I like it. So the reload speed variable isn't functional. Is that intentional? Oh, and I've found a bug... Don't ask me why or how, but there seems to be a leak of either bullets or ships. Put in values 1 - 10 - 5 - 3 - 1 - 5 - 10 - 10 and then run in debug mode. You don't need to play, but keep it running for a while and watch the instance counter. Wow! Before I knew it, an hour went by and I was still playing with this. Very interesting indeed! I was also surprised at how long I spent playing with it. I think I'm sufficiently bored of it now. Haha.